Dissolved organic matter (DOM) is recognized as a major component in the global carbon cycle and is an important driver in aquatic ecosystem function. Climate, land use, and forest cover changes all impact stream DOM and alter biogeochemical cycles in terrestrial environments. 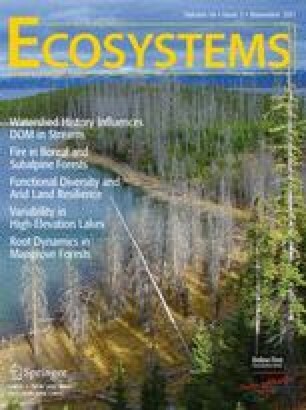 We determined the temporal variation in DOM quantity and quality in headwater streams at a reference watershed (REF), a watershed clear-cut 30 years ago (CC), and a watershed converted to a white pine plantation 50 years ago (WP) at the US Forest Service, Coweeta Hydrologic Laboratory, in the Nantahala Mountains of western North Carolina, USA. Average stream dissolved organic carbon (DOC) concentrations in CC or WP were 60 and 80% of those in REF, respectively. Stream DOM composition showed that the difference was mainly due to changes in humic-like components in chromophoric DOM. In addition, excitation–emission matrix fluorescence data with parallel factor analysis indicate that although the concentration of protein-like components did not differ significantly among watersheds, their relative abundance showed an enrichment in CC and WP compared to REF. The ratio of humic acid-type to fulvic acid-type components was highest and lowest at REF and WP, respectively. Our data suggest that forest ecosystem disturbance history affects the DOM quantity and quality in headwater streams over decades as a result of changes in watershed soil organic matter characteristics due to differences in organic matter inputs. Youhei Yamashita performed research, analyzed data, and wrote most of the paper. Brian Kloeppel helped in designing the study and contributed to sampling logistics. Jennifer Knoepp helped with data analysis and writing of the paper. Gregory Zausen performed all field work. Rudolf Jaffe conceived and designed the study, performed data analysis, generated the research funding, and contributed to the writing of the paper. The authors thank the Coweeta Hydrologic Laboratory for logistical support for this research and two anonymous reviewers for valuable comments and suggestions that helped improve the quality of this manuscript. This research was supported by the National Science Foundation both through the Coweeta LTER project (grants DEB-9632854 and DEB-0218001) and the Florida Coastal Everglades LTER project (grant DBI-0620409). YY thanks the College of Arts and Science at Florida International University for financial support. This is SERC contribution #528.